Read the book used by universities and colleges to introduce public administration students to the reality of municipal management. This is the story of how municipalities have become unsustainable and why it’s getting worse. Time for Cities maps out strategies for a sustainable future. Update. See the author's opinion on Constitutional Reform published in the October edition of Municipal World. In 2004, Canadian cities received 12 cents out of every tax dollar. Today, in 2013, it is down to a meager 8 cents. Time for Cities tells the story of how it got so bad and why it’s getting worse. The number of older homeless persons tripled in Vancouver. Are the homeless getting old? No. Old folks are becoming homeless. Toronto and other cities face bankruptcy. In small towns, water turns deadly. When the Federal government downloads programs and services, provinces get the money, cities get the problems. Governments pass a crushing burden onto cities and charities. Time for Cities explains how this happens and how to stop it. To achieve their potential, Canadian towns and cities need resources and powers. They need money to fix crumbling bridges and to upgrade rusting water pipes. They need to invest in public transit, develop our economy and use resources more sustainably. Canadian towns and cities need new powers to deal with festering social issues, global changes, migrant populations and criminal activity. 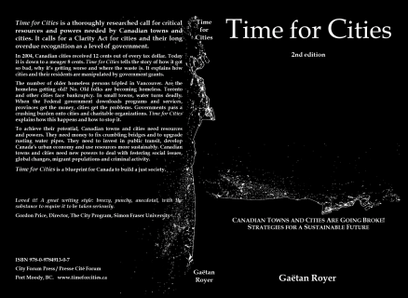 Time for Cities is a blueprint to build a just society in Canada .